The Writers Guild Foundation (WGF) is a non-profit organization and promotes itself as is the premier resource for emerging writers and pop culture devotees in Hollywood. According to their About Us page they are also unmatched in its efforts to promote and preserve the craft of writing for the screen. 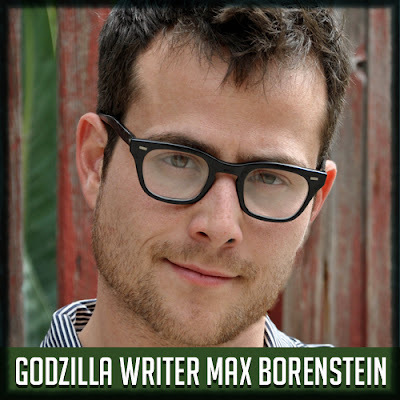 For $2000 WGF is offering lunch with Godzilla 2014 writer Max Borenstein for aspiring writers and filmakers. You can read the description below from WGF's Lunch with Godzilla writer Max Borenstein page. Have you guys seen that new GODZILLA trailer? It’s pretty amazing, with its more-enormous-than-usual, force-of-nature Godzilla and its use of the Gyorgyi Ligeti score associated with Kubrick’s 2001. It’s… something special. The writer of that movie, Max Borenstein, worked his way up from writing and directing his own shorts to crafting the screenplay behind what’s sure to be one of the biggest summer releases of 2014. We’re not going to tell you there’s any surefire way to follow a path like the one Max followed. But we are going to tell you that Max is an incredible resource for learning how to make your mark and make people notice you. If you’re going to learn, why not learn from someone at the top? If you’re going to go, go big… and baby, ain’t nobody bigger than Godzilla. IF YOU HAVE ANY QUESTIONS, CONTACT SANDY AT 323.782.4691 OR sallyn@wga.org. ONCE YOU HAVE MADE YOUR PURCHASE, CONTACT SANDY AT 323.782.4691 OR sallyn@wga.org TO BEGIN YOUR EXPERIENCE. You can purchase this lunch meeting at WGF's Lunch with Godzilla writer Max Borenstein page.